Since this post is being written in Philadelphia today, it only seems appropriate that our Sea Song of the Week is related to the City of Brotherly Love. We once mentioned that former-Dire Straits frontman Mark Knopfler had a song called Sailing To Philadelphia, so we dug it up for this week's Sea Song pick. The original release of the song featured James Taylor on vocals with Knopfler, but this video was recorded more recently without Taylor. Yes, we're vaguely aware that the song really doesn't have anything to do with sailing other than the title, but it is a great song to sail to. For more Mark Knopfler, visit his official website or read him up on the Wikipedia. But then we found about a show in our own back yard that we could not resist. Sure it's only one day long, and it's all the way up in Michigan, but with a name like the Blue Water Antique and Classic Boat Show and Ribfest, how could you not consider attending? For more info about this weekend's boating events and upcoming boat shows near you, visit our boat show calendar. Do not try this at home. The raw video below shows just how powerful water can be and is a reminder to all of us boaters that any body of water should be respected. In Iowa this past weekend, a nine-mile-long lake disappeared in just a few hours after heavy rain led to flooding which then destroyed a dam that had held the man-made lake's water for more than 90 years. Despite the party-like comments heard in this video, this was a significant and destructive event. Luckily no serious injuries were reported, but Lake Delhi homeowners and boat owners are facing millions of dollars in damage, and as NPR points out, residents now own property that can no longer be called "lakefront." Cruise 8,000 nautical miles on a boat made of 12,500 recycled bottles? Check. The Plastiki completed its journey earlier today from San Francisco to Sydney after more than 130 days at sea. During the trip, environmentalist David de Rothschild and his crew sailed by the Great Pacific Garbage Patch – a floating dump of plastic litter as big as the state of Texas – in order to bring attention to plastic waste in oceans. While the voyage of the Plastiki has achieved its goal of bringing awareness to this issue, the boat and its crew had a sort of unexpected competition from another mess in our waters – one that involved casualties, was closer to home, and seemed to catch us all by surprise. The Deepwater Horizon rig exploded less than 30 days after the Plastiki launched from San Francisco. The BP disaster killed 11 and injured 17 others, then went on to flood the Gulf with 100s of millions of gallons of oil while leaving the region void of seafood, tourism, fishing and oil jobs for who knows how long. Then, finally, thankfully, the leak was capped – at least temporarily – just a week before the completion of the Plastiki’s journey. Just in time to steal headlines away from the Plastiki again. Perhaps instead of taking away from the extraordinary efforts of the Plastiki, when discussing the BP oil mess, journalists should also remind us all of the Great Pacific Garbage Patch. Perhaps we should consider the two news item together and look at the plight of our world’s waters as a whole. Heck, we could even throw the China oil spill in there. With simultaneous oil disasters on opposite sides of the planet, and an enormous pile of plastic floating somewhere in the middle, would THIS be a good time to think about the extensive, preventable damage that is happening to our oceans? What a mess! When it was his turn to speak to the panel of the Presidential Commission last week, Drew Landry sang a heartfelt song, which was aired live on CSPAN. If you have not yet seen this, you've got to check it out. As soon as we saw Drew Landry's impromptu performance of BP Blues, we knew it would be our next Sea Song of the Week. A good song with a powerful message. A quote from Drew Landry on his website: "I really want to help the people of Louisiana. My main main concern is for the safety of fishermen, oil workers, and citizens along the Gulf Coast." Share this video with everyone you know, and visit Drew's website, DirtyCajuns.com, where you'll find his recommended resources for helping the communities of the Gulf Coast. There are major boating events all over North America this weekend, including Dallas and San Diego, as well as in Florida, New York, North Carolina and even up in Nova Scotia. This is also the second weekend of the Dallas Boat Show (map, more info). You may recall we suggested you hold off until this weekend to attend this show so that you can take advantage of the DIY Skills Class: How to Solve Common Boating Problems. If you were wondering what you'll get out of this class, check out this piece about the boating skills workshop in the Dallas News, or visit the workshop website for more details and discount admission. Thanks to either bad planning, a lack of communication, or perhaps some unknown feud between the organizers, New Yorkers have their choice of two boat shows on the finger lakes this weekend. Additional events this weekend include the Cape Fear Community College Boat Show and the Nova Scotia In-Water Boat Show. For info about all of this weekend's boating events, visit our boat show calendar. A story of five people, one 14 ft boat, one life jacket and a cooler scattered across the Chesapeake Bay for three hours. The lesson here is that if you must squeeze 5 people onto a boat that small, especially at night, everyone on board should be wearing life jackets – not just the kids, regardless of the law. Full story from the Baltimore Sun. Our tips on boating safety touch on that whole life jacket thing - check them out before you boat again. The Plastiki, constructed of 12,500 plastic bottles, is on its final approach to Sydney Harbour, expecting to arrive within a few days. This Q & A article probably gives one of the most accurate accounts of the crew’s adventure and noble mission, or you can follow David de Rothschild on Twitter for a first-hand account of the trip. The North Carolina Wildlife Resources Commission is reminding boaters about a new law that went into effect earlier this year requiring boat operators who are younger than 16 to have a certification card or proof of compliance and photo identification with them if they are driving a vessel with a motor of 10 horsepower or greater. Want more info about boating in North Carolina? Visit our local NC boating page. Boat owners across the US have spoken. Last week, Marinalife announced the winners of its 10th Anniversary Best Marina contest, based on a poll of thousands of marinas and their customers. In the category of Best Transient Marina, the winner was Nantucket Boat Basin. Nantucket Boat Basin is a 240-slip, full-service marina located two blocks from Nantucket Town, the historic seaport on the island of Nantucket - 26 miles south of Cape Cod, Massachusetts. In the category of Best Customer Service, the winning marina was Haven Harbour Marina, in Rock Hall, Maryland. Haven Harbour Marina is a full-service 217-slip marina located in a protected cove on Swan Creek, in the heart of the Chesapeake Bay. For more details about the contest and the winning marinas, visit www.marinalife.com or see the full press release. If you've been to one of these marinas, or have a favorite of your own, we want to hear about it. Please share your comments on our Facebook page or on the Daily Boater. With scorching temperatures across the country over the weekend, it's no wonder so many boaters took to the water if they were able. But when there are lots of boats in the water, unfortunately, there are often lots of mishaps… and there were a few stories that caught our attention this morning. As both articles mention, and as we get all preachy about on our boating safety page, life jackets would have been key in this situation, and kudos to the boaters if they were actually wearing them. On Lake Michigan Sunday, a flash storm snuck up on at least one couple and capsized their 18 foot boat. After an hour in heavy rain and rough water, 6 miles from shore, they were rescued by a chartered fishing boat according to the Chicago Sun-Times. This author would like to think they drifted quite a bit before being rescued rather than think they were six miles out in a rowboat with a storm approaching. Would a weather radio have helped these boaters avoid this near-tragedy? There were several other incidents on the water over the weekend, but hopefully you had a safe time on the water. And this would be a good time to remind you that there's never a bad time to review the boating safety tips on FirstBoat.com. Today's Sea Song of the Week is Where the Boat Leaves From, performed by Zac Brown and Jimmy Buffett together on stage in Atlanta earlier this year. We were introduced to this song last Sunday when Jimmy Buffet performed it live at the Gulf Shores / CMT concert, and now CMT is saying there may be more free concerts to help the Gulf Coast - even as the headlines are filled with reports that the oil has finally stopped gushing. For more Jimmy Buffet, go see him on tour (we suggest the shows in Paris or Vegas). And you may have better luck trying to catch a Zac Brown Band show, as he seems to have a bit of a more aggressive concert schedule. Are in Dallas, southern New England or southern California this weekend? Or way down under in South Australia? Good news - there's a boat show near you. The Dallas Boat Show actually runs this weekend and next weekend, but not on the days in between. If you have to choose, we recommend you wait until the 2nd weekend and check out the DIY Magazine skills workshop: How to Solve Common Boating Problems. 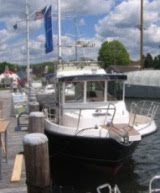 The boat show in Rhode Island is actually a Trawler Fest, being held for the first time in Warwick at Brewer Greenwich Bay Marina. If you go, look for our editor wearing a FirstBoat hat... say "hello" and win one just like it. On the spot. Until he runs out. Somewhere on the California coast between Malibu and Santa Barbara is a town named Oxnard, which is home to a marina called Channel Islands Harbor. 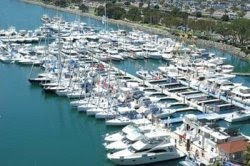 Sounds like a beautiful place to visit any time of year, but if you go there this weekend, you'll find the Ventura County Boat Show. And if you go to today or tomorrow (Thurs or Fri), admission is a buck or less. More info. For info about all of this weekend's boating events, including the Mystic River Mudhead Benefit Cup regatta, the boat show down under, and the Phuket Multihull Championship, visit our boat show calendar. In a quick scan of the day's boating news we found multiple stories of boaters adrift, as well as a few boats running aground. It seems that About.com Powerboating guide Ericka Watson's latest edition of Boat Tips, which tells you what to do if your engine fails while underway, couldn't have been timelier. A novice sailor over in the UK called for help for two separate incidents this past weekend – Once when he was lost, and a 2nd time when his boat became grounded, according to KentOnline.com. And in Rhode Island, after several confusing reports about the type of boat and number of passengers, it has been determined that a workboat flipped over in rough water near the Sakonnet Lighthouse on Monday. The three men on board (not 7 as we first mentioned on our Facebook page) found terra firma on the rocks around the lighthouse before being rescued. Of course, even an able-bodied seaman runs into trouble once in a while. Take the case of former President George H.W. Bush. He was a naval airman in WWII and is a very experienced boater and fisherman and knows the area where he was boating quite well. 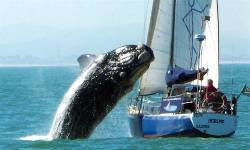 But even he couldn't avoid running aground yesterday near his home in Maine. There were enough locals snapping pictures to get the story on the evening news, but of course everyone was fine. Safe boating should be taken seriously, regardless of your experience level. Check out Ericka's article on engine failure as well as the FirstBoat safe boating page for more tips. Many recreational boaters that would normally be motoring or sailing around the Gulf of Mexico this time of year are taking refuge elsewhere. Lakes, reservoirs and rivers, as well as much of the Eastern Seaboard, are all in play. We've heard anecdotal stories of larger than normal crowds of boats on Florida's east coast and in the Keys, as boaters look to escape the oil-infected Gulf. In fact, Keith Still, blogging for the AJC, noted that many families that usually head to Gulf region for summer vacation "have set their sights on the coasts of South Carolina, Georgia and eastern Florida," and that it is "difficult to find beach lodgings available on the Atlantic during the weeks they can go on vacation." THV's Amanda Terrebonne reported recently that many visitors have come to Lake Ouachita, the largest lake in Arkansas, to escape the mess in the Gulf. And just yesterday, David Elliott reporting for WLOX.com, mentioned that people "are traveling to the 640 acre lake at Flint Creek in Stone County (Mississippi)" to find cleaner water for recreation. We understand many boaters and fishermen, especially those who make a living on their boats, have been busy doing what they can to help clean up the oil – participating in the "Vessels of Opportunity" program. Lending a boat and lending a hand seems to be a common theme, and it's good to hear some stories of people getting paid and feeling useful in the wake of this disaster. If you're a displaced boater in the Gulf, we want to hear from you. Are you able to get your boating fix near home or are you traveling far to find cleaner water? 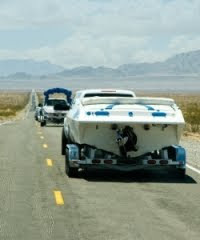 Are you changing your travel plans and towing your boat elsewhere? Tell us about it. Please comment on the Daily Boater or on the FirstBoat page on Facebook. 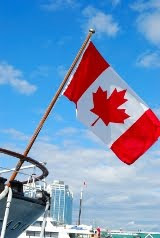 After only a few weeks into the first summer in which Canadian boaters are required to carry a Pleasure Craft Operator (PCO) Card, the country's government is planning to make the associated test more difficult in 2011, according to CBC News. While the motivation of this move is surely to increase boating safety, perhaps the move will encourage more Canadian boaters to take the exam this year while the test is still easier. More boaters taking the exam voluntarily means more revenue, right? It makes sense, and many boaters who have been putting it off, or who are planning to get their first boat in the next couple of years, may take the test now rather than later. If you want to play along and make sure you're compliant, you can take the current "easier" exam online right now at BoaterExam.com. Of course, all boaters should be educated and trained to operate a boat before they get behind the wheel, but that's not the case in many states here in the US. In fact, the "and trained" part of that last statement isn't even required anywhere in the US and Canada for recreational boaters. As we mentioned in May while telling you about a women-focused on-the-water training company, new boaters should seriously consider boating education outside the classroom - and we don't mean online. New boaters should have at least some hands-on training before getting behind the wheel of their boat, just like they get for a car. This fact was brought up again recently in our LinkedIn discussion group when USCG Licensed Master and ASA-Certified Sailing Instructor Captain Andrew Seligman shared an article from Professional Mariner. The piece focuses more on professional captains than recreational boaters, but it really brings home the dangerous fact that "You only have to be book smart to get a captain's license." How do you feel about boating exams, online tests and on-the-water training? Comments welcome on the Daily Boater blog, or in our LinkedIn group. After last night's news about LeBron, our Sea Song of the Week had to include Miami and boats. Since we already selected the theme song from Miami Vice back in 2006, we wanted to go a little deeper today. There are no lyrics to The Great Boat Race by Jan Hammer, but the music could accompany any boat excursion whether by power or sail. Trust us, you won't be disappointed by the boat race in this video even though it is over 25 years old. By the way, Jan Hammer is still making music and soundtracks to shows you wouldn't have guessed. Of course, he has an official website that you should check out. This weekend's boat shows include events in Texas, New York, Connecticut and the Bahamas. Texas is home to what may be the biggest event of the weekend, and not only because everything's bigger in Texas. The 7th Annual Southeast Texas Great Outdoors Expo is rolling into Beaumont from Friday to Sunday, and it's not just about boats. The show claims to be featuring "the best in hunting, fishing, outdoor sports equipment, ATVs, boats, cooking, camping and so much more!" 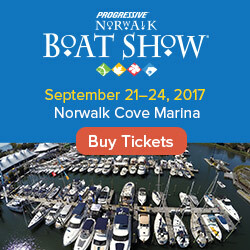 Find a link to the show website and more info on our boat show calendar. New York and Connecticut are both hosting antique boat shows this weekend. New York's show looks like the bigger event, and is being held Friday through Sunday at the Village Casino in Bemus Point. The "Village Casino", by the way, does not appear to be an actual gaming casino. 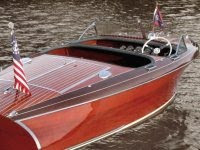 In Essex, Connecticut, the 26th Annual Mahogany Memories Antique & Classic Boat Show is only on Saturday at the Connecticut River Museum. Unlike the wooden boat show two weeks earlier in nearby Mystic, CT, this weekend's event in Essex is free to attend. Last but not least, if you're in the Bahamas on Sunday afternoon then you should stop by the Power Boat Show at Junkanoo Beach Club to see "some of the fastest and hottest speedboats around." It's hard to tell from the website, but this event may be more like an air show with boats than a traditional boat show. If anyone has info on this, please let us know. Update: Last week's Jimmy Buffett concert in Alabama was rescheduled to July 11. The free tickets are gone, but the concert will air live without commercials at 6 p.m. Sunday on CMT. It will also be streamed live on www.CMT.com. For more info about all of this weekend's boat shows and a preview of upcoming boating events near you, visit our boat show calendar. As the official blog of FirstBoat.com, whose visitors include many a new boater, we here at the Daily Boater love to find good boat tips. 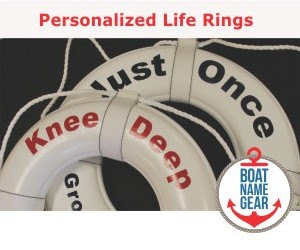 Heck, even more seasoned boaters may hate to admit it, but we could all use a reminder now and again… for safety's sake. So when we found out that Ericka Watson, About.com's Powerboating blogger, had begun a new feature on her blog called "Boat Tips", we immediately asked her if we could get on board and share a few of her tips with our readers. One of Ericka's first tips is about maintaining a proper lookout - a Coast Guard Navigation Rule that doesn't get as much attention as it should. Ericka sums up this tip nicely when she says, "Simply put, look around and listen for danger in all conditions so you can make good decisions and avoid hitting another boat, something in the water, or even land." But as Ericka explains, there's much more to it than that. 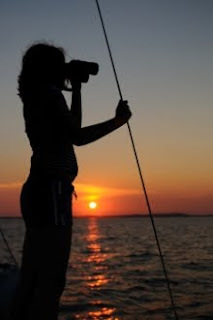 Check out Ericka's Powerboating Blog for the full tip about keeping a proper lookout while boating. We often highlight the many accidents, arrests and other shenanigans that happen on the water after a busy weekend like the 4th of July, but this time we have good news to report from the state of Georgia. The Atlanta Journal-Constitution reported yesterday that boating accidents and boating under the influence arrests over the July 4th weekend dropped significantly compared to last year in their state. It's nice to hear about the good stuff once in a while. Okay, now that we’ve got the good news out of the way, we found it strange to see more than one story over the weekend with the words “found dead on boat” in the headline. In one story, two Florida boaters were found dead on a cuddy cabin boat, which was anchored at Disappearing Island in Ponce Inlet. Carbon monoxide from an onboard generator may have been the cause according to wdbo.com. In the other story (and you probably already saw this if you're a hockey fan), former Detroit Red Wing Bob Probert died while boating in Windsor, Ontario over the weekend. The initial breaking news headline announced that Probert was “found dead on a boat”, but eventually it was reported that he died after experiencing chest pains while boating with his family. There were, of course, many other incidents and accidents on the water over the weekend, but this was one we couldn't pass by without stopping and taking a closer look. A 7 year old in Virginia crashed a powerboat into a pier, killing his mother who was sitting on the bow. No news reports have been able to say why the 7 year old was operating the vessel while other adults were in the boat during this tragic accident, but Virginia has no minimum age requirement for operators of powerboats. To kick off the 2010 Fourth of July Weekend, we wanted to find a Sea Song of the Week that was about boats but that also could be interpreted as patriotic for some people. We think we found it, but first a word of warning: Watching this video may make you want to travel back in time to Shea Stadium in 1971 to watch Grand Funk Railroad perform I'm Your Captain (Closer to Home). The opening of this video also reminds me of a classic TV show or two from the era as they roll out the band member's names on the screen. Looks for the flag shirt, the flag shoes and the Schaefer beer. Good times. If you'd like to see a Sea Song from a different era, check our YouTube channel for a few of our recent selections. Hope you enjoy the long weekend, and are able to spend at least part of it on the water! In addition to watching fireworks from your boat this 4th of July weekend, you can also watch a boat parade in many communities across the US. You can even enter your own boat in the parade, and possibly win a prize if your boat is festive enough! 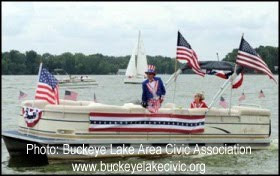 We've listed several boat parades around the country in our boating events calendar, but we may have missed a few. If you don't see one near you on our calendar, check with your local town marina or yacht club to see if there's a boat parade near you. Not really a 'boating event', but worth mentioning. The Jimmy Buffett & Friends concert scheduled for tonight (July 1) in Gulf Shores, Alabama, has been rescheduled for July 11 because of concerns about surf conditions on the beach from Hurricane Alex. CMT has just confirmed on their website that they will air the show live and commercial-free, and stream it on CMT.com. The performances will be simulcast live on Radio Margaritaville, available on Sirius Satellite Radio and XM Satellite Radio. 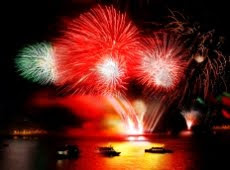 This is the day of the week we normally tell you about the boat shows for the upcoming weekend, but with Independence Day in the USA, there are no boat shows anywhere on this side of the world. 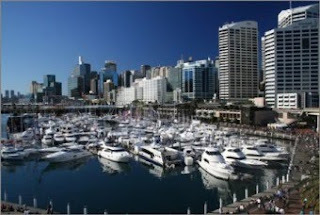 However, if you're in Australia this weekend, be sure to check out the 50th Melbourne Boat Show, which starts today and runs through Monday, July 5, at the Melbourne Exhibition Center. For more info about this weekend's boating events or to find a future boat show near you, visit our boat show calendar.